This week I did my first slot on the ABC New England North West Creepy But Curious Radio show. You can listen to it here. I am very pleased to announce that myself, along with Aki Watanabe and Marc Jones will be leading a Symposium and associated workshop on Geometric Morphometrics in Paleontology at the Annual Meeting for the Society of Vertebrate Paleontology in Dallas Texas October 2015. Podium Symposium: The Shape of Things to Come: Geometric Morphometrics in Vertebrate Paleontology. Details are here. The oral presentations (invited speakers only) will take place in one of the morning sessions, with 16 speakers, which we believe will provide you with a broad range of theory and applications of GMM in vert paleo. The Workshop: Geomorph: R Package for the Collection and Analysis of Geometric Morphometric Data, is scheduled for Tuesday, October 13, from 9:30 am – 4:30 pm, at the Hyatt Regency Dallas. Registration for the workshop costs $40 and is open to all SVP 2015 participants. Places are limited to 20 participants. The purpose and intended outcome of the workshop: Geometric morphometrics (GMM) has become an increasingly popular method for quantifying and analyzing the morphology of specimens in vertebrate paleontology. The integration of GMM data with multivariate statistics and phylogenetic comparative methods makes it a particularly powerful and versatile technique for tackling biological questions related to shape. Recently, the proliferation of available software for collecting, analyzing, and visualizing shape data, especially in 3-D, has driven this growing adoption of GMM. The primary objective of the workshop is to equip the participants with the competency to collect and analyze GMM data in the freely and openly available “geomorph” R package. Topics covered will be largely practical with some theoretical components, including (1) digitization of specimens; (2) superimposition techniques; (3) multivariate statistical methods; and (4) comparative phylogenetic methods. The workshop expects the participants to bring their own laptops and have some proficiency with R statistical software. Although example data will be provided, participants are encouraged to bring their own data sets. From this workshop, the participants will acquire their own GMM data set, in addition to the skill and resources to execute analyses on their shape data. Hola! I am delighted to announce that I have been invited to present a seminar in Madrid at the Complutense University on Monday 17th November 2014. I am being hosted by Dr. Diego San Mauro of the Department of Zoology and Physical Anthropology. The seminar is open to staff and students of the University as well as those affiliated with the Madrid's Museo Nacional de Ciencias Naturales (Museum of Natural Sciences) and any other academics of Madrid's various institutes. Burrowing underground is a common life strategy in the animal kingdom, providing protection from changing climates and predators. I shall give an overview of my research into the morphological evolution of burrowing animals – predominantly limbless vertebrates, but with a brief diversion into molluscs. In doing so, I shall demonstrate the cutting-edge techniques I develop and apply to address classical questions of macroevolution. I shall be presenting at the new Conference on Modern Phylogenetic Comparative Methods and their Application in Evolutionary Biology in Seville, Spain in November 11-15th 2014. Abstract below. In this talk I shall demonstrate with some interesting biological examples, the various methods now available to combine shape data with phylogenetic comparative methods, all of which are implemented in our software package Geomorph. Should be a great meeting. Hope to see you there! Studies of evolutionary correlations commonly utilise phylogenetically independent contrasts or phylogenetic generalised least squares to assess trait covariation in a phylogenetic context. However, while these methods are appropriate for evaluating trends in one or a few traits, they are incapable of assessing patterns in highly-multivariate data, as the large number of variables relative to sample size prohibits the algebra from being completed. This poses serious limitations for comparative biologists, who must either simplify how they quantify phenotypic traits, or alter the biological hypotheses they wish to examine. Geomorph (www.geomorph.net) is an established package in the statistical environment R (CRAN) that provides functions to analyse high-dimensional data in a phylogenetic context. Here I shall demonstrate several geomorph analyses using example datasets comprising landmark-based morphometric data: ANOVA and regression models for analysing trait covariation with continuous and discrete variables, phylogenetic two-block partial least squares analysis for covariation between sets of traits, estimating the rate of morphological evolution in multivariate datasets, and a generalised K statistic for estimating phylogenetic signal. Together, these functions provide an operational platform to enable macroevolutionary biologists to test hypotheses of adaptation and phenotypic change in high-dimensional datasets. I will be joining my fellow FEAR lab colleagues at the 74th SVP in Berlin this November. My colleague Brian Kraatz will be presenting our paper entitled "Evolution, ecology, and modularity of the lagomorph skull" in the Technical Session VI "Euarchontoglires", on Thursday, November 6, 2014, 8:00 AM - 12:15 PM. Hope to see you there! I am delighted to announce that as of 15th September, I will be taking up my new position as Lecturer in Zoology at the University of New England, New South Wales Australia. I am going to be a part of the The Function, Evolution and Anatomy Research (FEAR) lab, bringing my expertise in Geometric Morphometrics and large-scale 3D datasets to the team of Functional Morphologists. I will also be teaching the Principals of Zoology course. I can't wait! I've been hard at work these past few months on improving the 3D visualisation capabilities of geomorph, our R package for analysis of geometric morphometric data. Of note is the implementation of 3D Warping. Version 2.0 of geomorph brings new developments in how shape deformations from 3D coordinate shape data can be viewed. I have implemented a set of neat functions for warping of 3D surface files (e.g., .ply files), which allows the user to visualise the shape deformations along Principal Component axes, Multivariate Regression slopes, Partial Least Squares axes and group differences, to name a few. 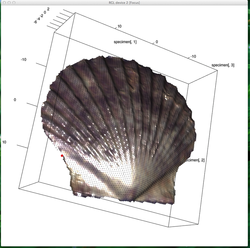 The new function ﻿warpRefMesh reads in a .ply ﬁle and landmark coordinates associated with this specimen, and uses the thin-plate spline method (Bookstein 1989) to warp the mesh into the shape deﬁned by a second set of landmark coordinates, usually those of the mean shape for a set of aligned specimens. When using this function for warping, it is highly recommended that the mean shape (derived from the users sample using mshape) is used as the reference for warping (see Rohlf 1998). See my blog on geomorph.net for the workflow. But most importantly, lets look at some eyecandy! My new postdoctoral position at Iowa State University is already being very fruitful. I am now a co-author to the geometric morphometrics digitizing and analysis software in R, called geomorph. For a detailed look at what the software does, take a look at the CRAN pdf or this paper. In brief, the software package is designed to be used for digitizing 2D and 3D landmarks, and implementing many of the common (and some not so common) procedures and statistical analyses with these data. Digitizing of landmarks and sliding surface semi-landmarks on three-dimensional structures was already implemented by my co-authors, using the vertices of 3D surface models (e.g. ply models). I have improved these existing functions to take full advantage of the enhanced plotting capabilities of PLY files with rgl (the ply files are read in and stored as objects of class Mesh3d) . Now the digitizing experience is more user friendly; the color detail of the meshes and the plotted faces allow better visualization of complex meshes, and the software is now compatible with functions in the Morpho R package. We welcome users to try out the new digitizing functions and tell us what they think! You can send me a message here (right) or visit the geomorph blog page.